– A center of excellence gives us stability and a dedicated resource to work with company cooperation. It also creates credibility for our partners and strengthens the space profile for Luleå University of Technology, said Olle Persson, leader of the new center of excellence. 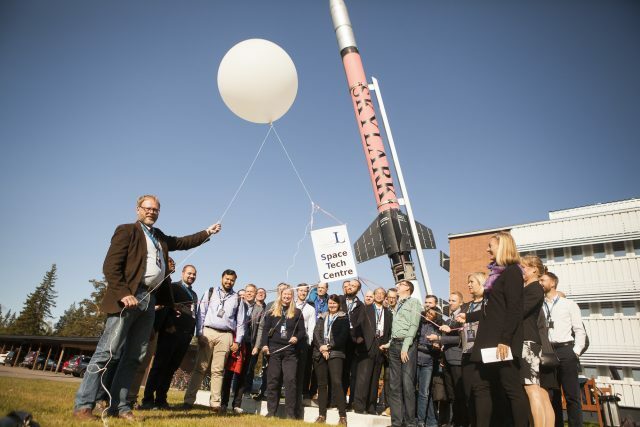 Together with the first partner the Swedish Space Corporation, Olle Persson inaugurated the center of excellence during the Space Innovation Forum that was held at Esrange. – We need to have an even closer cooperation with Luleå University of Technology to find the right competence and solutions for our future challenges, said Lennart Poromaa, head of SSC Esrange. Around 50 people participated represented a wide range of space industry, such as SSC, GKN Aerospace, OHB Sweden to academia from Luleå University of Technology and KTH. Olle Norberg, newly appointed vice chancellor at Luleå university of Technology with specialization in Space and also the former head of the Swedish space board, was impressed by the future plans for the space industry in the region. – The coming years will be extremely fascinating. The participants at this event represents over a billion swedish crowns in possible infrastructure investments for Norrbotten. The space industry is growing fast and is a very competitive field. If we want to be a leader then we need the best and the brightest. That competence can only be found when university and industry work together, said Olle Norberg, vice chancellor at Luleå University of Technology and former head of the Swedish space board. Together with the inauguration the RIT project was also successfully concluded. One of the main goals was to establish a new center of excellence in Space Technology at Luleå University of Technology. The other was to fund eight industry PhD’s in the field of space for the first three years as well as laying the foundation for an innovation support system suitable for the space industry. – We reached all our main goals in the project and I feel that we’ve made a distinctive difference in the region. We have gotten the space industry to work together much more closely and when people meet, things start to happen, say Johanna Bergström-Roos, project leader. Several other partners also expressed their joy about the RIT-project such as the giant aerospace manufacturer GKN Aerospace. – Research and development are extremely important in the aerospace industry and RIT has allowed us to try more innovative ideas and to find new competence from the university, said Patrik Johansson, manufacturing engineer at GKN Aersospace. But also smaller and more specialised SME’s have found use in the RIT project. – RIT has been important to us because we don’t have the possibility to run this type of development projects for ourselves and RIT has also been a good way of working for us, said Per Bodin, Head of the AOCS department at OHB Sweden. The project has also meant new startups in the region. – Through this project I got connections to the space researchers at LTU. They needed someone to provide them with a mobile signal station and I could deliver that. Without RIT I wouldn’t have started my company N66Connect, said Jan-Olof Sänkelä, CEO of N66Connect. Johanna Bergström-Roos the project leader for RIT is now looking towards the future. – We are currently looking into a continuation project for the future. I cannot go into details but if things go as planned the future looks very promising for the growing space industry in this region, I would also like to thank our co-financers that made this possible, and they are The European Regional Development Fund and Region Norrbotten.